This exciting 6th Annual event sponsored by Inspiration Journal and KHWA will take place in Lihue at the Kaua'i War Memorial Convention Center. There will be 100 vendor booths, informative speakers and more. Check back here for more detailed Expo info and booth registration. 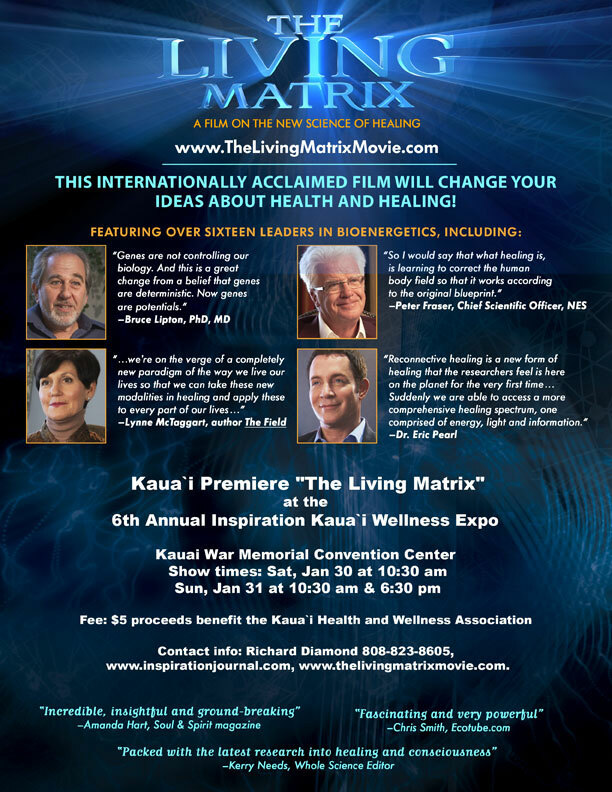 Kaua`i Premiere "The Living Matrix"
VIP Package: $75 includes an intimate reception with Dr. Sha and VIP seats at the Keynote Presentation. Tickets will be available at the Expo. Booth registration form available here. Contact info: Richard Diamond 808-823-8605 thelivingmatrix.com. 12:00 Spirituality in Medicine, Elizabeth Chen Christenson, MD, LAc. See you at the Expo! Enjoy and Celebrate 2010! More type here.